Fantastic quality condition yet, over 100 years old! With the Christopher Columbus obverse and the famous ship, the Santa Maria, on the reverse. This was the first U.S. commemorative coins struck by the United States, 100 years after the first mint was establish in 1792 and 400 years after Columbus' maiden voyage. Although a true pioneer and discoverer, Columbus was very much a product of his prejudicial times, and many historians agree that he and his men mistreated Indian populations in order to get their gold. A controversial and historical coin, Congress authorized the mintage in 1892 to help fund the Columbian Exposition in Chicago. It was only struck in 1892 and 1893, when the world's fair opening was delayed. Only 950,000 were struck in 1892 and 1,550,405 were struck in 1893. 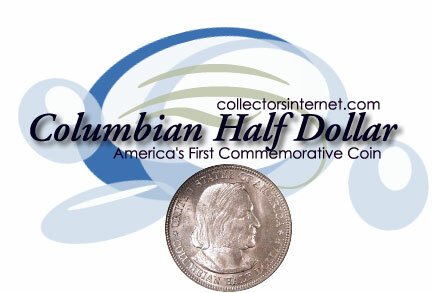 Many of these were heavily circulated and substantial quantities are believed to have been melted in later years to be restruck as regular circulating half dollars. Seldom seen in attractive Almost Uncirculated or nicer condition, we have been hoarding some of the more beautiful examples for years and now can offer a very special deal: Limit: 20 of each date per customer. Seldom offered nicer. Nice Borderline Brilliant Uncirculated with plenty of luster and lustrous gold toning, attesting to it's original condition. We pick only nice, spot-free coins with beautiful luster and handsome toning that's not too dark or spotty. Dripping with original beautiful white mint blast or with gorgeous light golden lustrous toning, with no spots nor distracting marks. Carefully chosen for museum-quality eye-appeal, unlike many on the market that are much too darkly toned. You may request beautiful lustrous gold toning or white mint luster, or let us choose the prettiest ones for you. Our goal is to have you re-order time and time again.